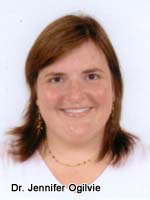 Regenerative Medicine Today welcomes Jennifer Braemar Ogilvie, MD. Dr. Ogilvie is an Assistant Professor in the Department of Surgery, Division of Surgical Oncology, Section of Endocrine Surgery at the University of Pittsburgh Medical Center, and a faculty member at the McGowan Institute for Regenerative Medicine. Dr. Ogilvie discusses her clinical focus on endocrine surgery and her current regenerative medicine research interests that focus on the development of tissue-engineered endocrine organs, in particular bioengineered parathyroid and adrenal glands. Also, her initial studies on the development of a tumor vaccine and her strong commitment to student mentoring are discussed.